American designer Zac Posen created this dress while a fashion student in London studying at Central Saint Martins School of Art. The dress was part of a 2000 V & A exhibition, Curvaceous, and takes inspiration from historic undergarments in the Museum's collections. 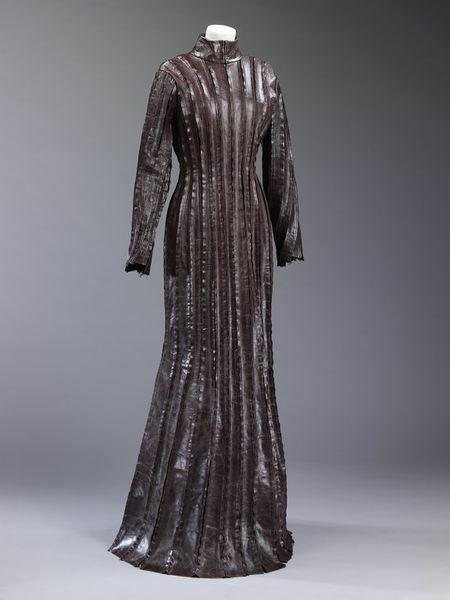 In this dress which is made of strips of leather Posen has employed the common undergarment fastening of hooks and eyes to the extreme: the only seams in the dress are at the neck and shoulders. 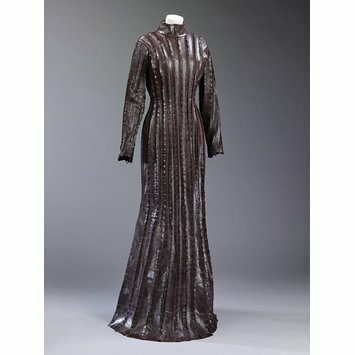 Posen returned to New York and founded his own fashion label shortly after this dress was displayed. He now sells his clothes across the US, Europe and Asia. Full-length, high-collared dress with long sleeves made from numerous thin strips of brown leather. Each strip is attached to the next with many hooks and eyes. The collar is lined with brown silk.